I mentioned awhile back about buying some vanilla beans to make homemade vanilla extract and wanted to show you how easy it is to make. There are tons of blog posts out there with the same directions. Everyone’s directions are the same the only difference in my blog post is that I didn’t run out and buy expensive bottles for mine. I used what I had on hand. Once I knew I was going to make homemade vanilla extract I started collecting small bottles when I went out to the thrift stores. And since I make jam I also had small canning jars on hand. If you have been putting off making homemade vanilla extract because you don’t have cute little brown glass bottles don’t worry about it. Use what you have on hand. If I waited to do some of the things I want to do until I had exactly the “correct” supplies on hand I would never get to do anything. Matter of fact you don’t even need small bottles you could just pour a bit of the vodka out of the bottle and put your vanilla beans in there. Then you can transfer the extract into smaller bottles for your own use or as gifts. With that purchase I also received 1/4 pound Tahitian Grade A Vanilla Beans free. All together I got about 100 vanilla beans for $31 including shipping. A very good buy I think. To make homemade vanilla extract you simply put a couple of vanilla beans in a glass jar and pour vodka over it. Let this cure for about 6 weeks or longer. 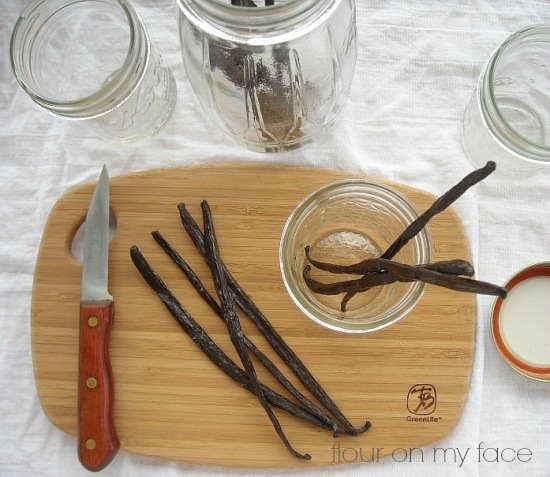 The more vanilla beans you add to each jar or bottle the stronger your vanilla extract will be. 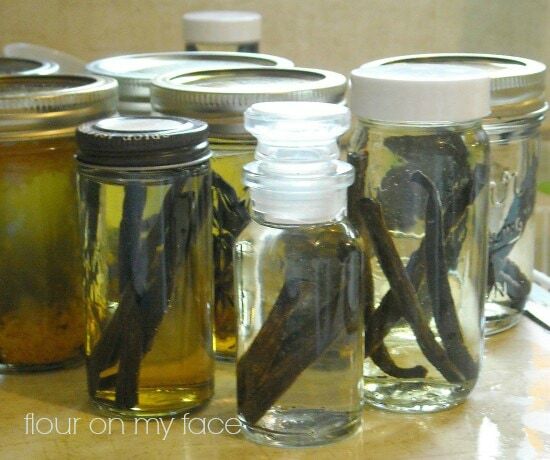 For the small recycled spice jars I used two vanilla beans. Before putting the beans in each glass container cut the vanilla bean in half and slice the vanilla bean up the middle almost to the tip. The vodka will infuse with the vanilla bean goodness and in minutes you will see the vodka turning a soft brown color. For the half pint canning jars I use three or four beans. Some of my jars contain other spices. I decided to try and come up with my own vanilla blends. I made one vanilla cinnamon extract by placing a couple of split vanilla beans in the jar with a cinnamon stick I broke in half. I made one vanilla, orange and cinnamon extract by adding vanilla beans, orange zest and a cinnamon stick.And I made a one jar of vanilla and orange by placing a couple of vanilla beans and orange zest in a half pint jar. I’ll be interested to see how these blended extracts turn out. Put your jars in a cool dark cabinet and let them do their magic. Every week take each jar out and give it a shake. My cabinet has a lovely vanilla scent now. Each time I open the door a yummy rush of vanilla flows over me. Have fun making your own extracts. It’s very easy and fun to experiment! Oh my this really is so so easy! I buy vanilla beans in bulk at our local Farmer's Market. I also have small problem with buying every jar I see at Goodwill. Now I have a reason to use them! Thanks for sharing, great post! WOW! I'm just now running out of the gigantic bottle of delicious Mexican vanilla that I bought across the border 3 years ago. I'm not planning any trips to the border any time soon, so I'll give this a try! 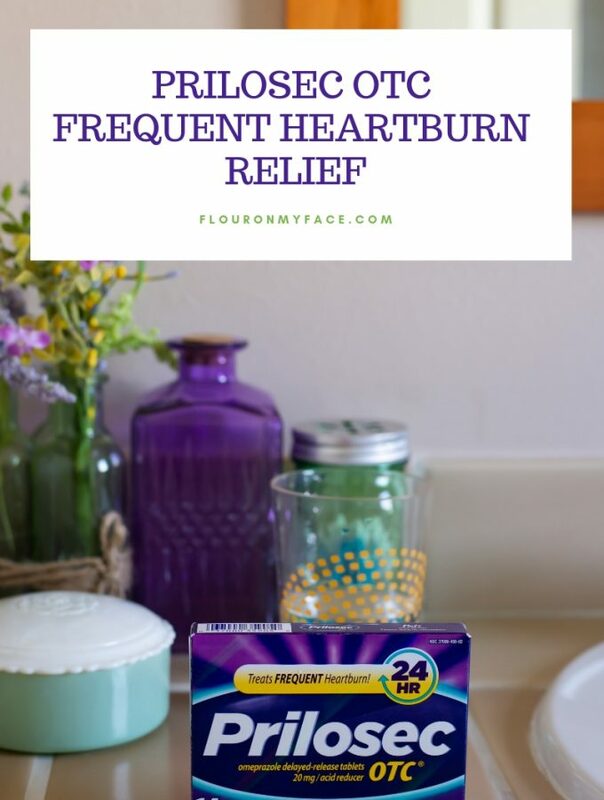 Wow – so fun and easy! I had no idea! I love how easy this is! Thank you for sharing! Stumbled! We only get vanilla flavoured sugar or commercial vanilla extract where I live. Your recipe sounds very nice and easy to make, if I get my hands on some vanilla beans, I will definitely try it out. I'm a bit fan of vanilla, but would love to make my own essence. I like that you used what you had around the house, like jars and such. WOW! I didn't know you could do this so easily. Thanks for reference as to wear to buy vanilla beans since I live in the back forty of rural America. I love the design of your blog too. It looks yummy in every way. 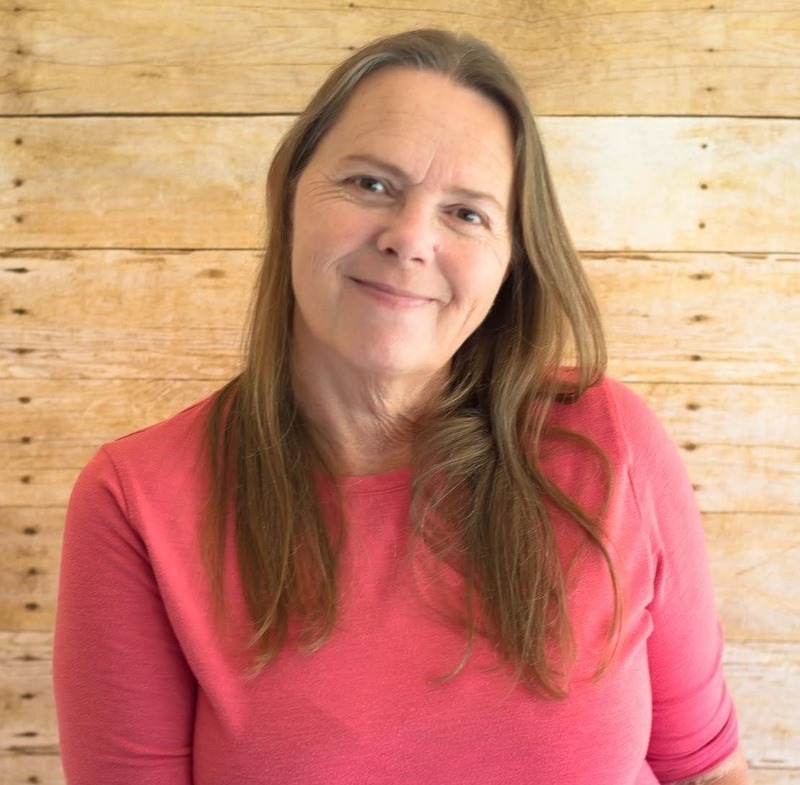 I was about to buy jars and found your blog – no need to buy jars now! I have a 750ml bottle of vodka with beans in it that is now 3 months old…smells absolutely fabulous. 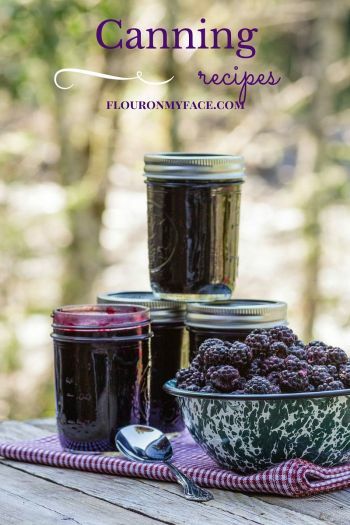 I want to bottle some for friends – now will just use a canning jar! Thanks! How many vanilla beans do you add to the 750ml bottle of vodka? Anita I did this on a much smaller scale. I used about 15 beans to a quart. The quality of the vanilla beans will make a difference also so uy the best you can afford. just so you know you can get really cheap amber bottles at specialtybottle.com I recently made some vanilla and am giving it for gifts, so I wanted the cute little bottles – they were like $0.50 each! This looks so fun and easy! I've bought vanilla beans here before and liked them! http://www.wildbeanvanilla.com Thanks for posting!! This is really good to know. 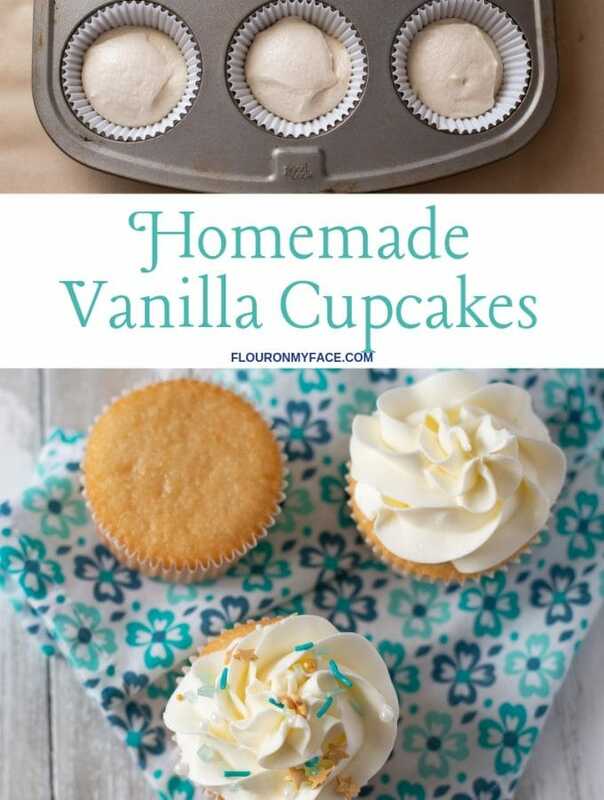 Hey you can also make vanilla sugar the same way just add a vanilla bean in a bowl or jar of sugar and it infuses the sugar with the vanilla flavor. Yes I know I have a couple of jars of vanilla sugar also lol! I had absolutely NO idea of the ingredients. 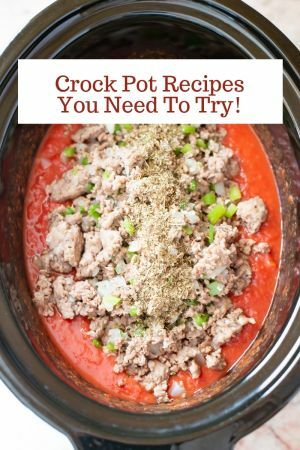 This is a gem of a recipe and it sounds so easy to make. The holidays are coming up and I bake all gifts. This is the end of September. I’ll start on this in the next few days. I start my baking around the 20th of December. This is timely and AWESOME!! Thank you!!!!!!!!!!!!!! I’ve been making vanilla extract for several years now, and discovered an even cheaper way to make it rich and yummy – although it takes longer. It actually only takes 3 beans per quart, as long as you let it cure for a minimum of 3 months, shaking the bottle about once a week. Process it in the vodka bottle itself, then use it straight out of there as well, so you only need other bottles for gift giving. Save the beans to add to the next batch with its fresh vanilla beans, or stick in a jar of sugar for two weeks, or add to applesauce. No one can tell the difference between the 6-week/12 bean vanilla, and the 3-month/3 bean kind. I agree the longer you let it cure the better it is. Homemade Vanilla Extract is so much better than commercial. Most commercial vanilla extract uses vanilla beans, alcohol and water. I usually make vanilla sugar with my left over or even used vanilla beans. I don’t think I can agree with you about no one knowing the difference between 6 week and 3 month cured vanilla extract. I know I can tell the difference. The younger batch had a much more alcohol scent to in then the older batch. The older batch is also a much darker golden brown color. I am posting a new vanilla extract post this weekend. Be sure to watch for it. Yes, I’ll be looking for your new recipe, thanks! When I said no one could tell the difference, I was referring to the ratio of beans to vodka. Here at our house, we noticed that fewer beans with longer cure time had as much rich vanilla flavor as more beans with shorter cure time. Sorry for not being clear on that…..
One of my favorite uses for homemade vanilla is my homemade cold-brew hazelnut frappuccino. Yumm!! I understand now. Sometimes it is so hard to get a clear point across in a comment. I agree less beans with a longer cure time does do the job. Yumm on the cold brew frap. I also make a cold brew iced coffee but I’ve never added any vanilla to it. I will have to try it. Can you tell me how long it will last? Do i treat it just like store bought vanilla? No need to refrigerate? How long will the vanilla beans last if I don’t use them all at once? Will they go bad? 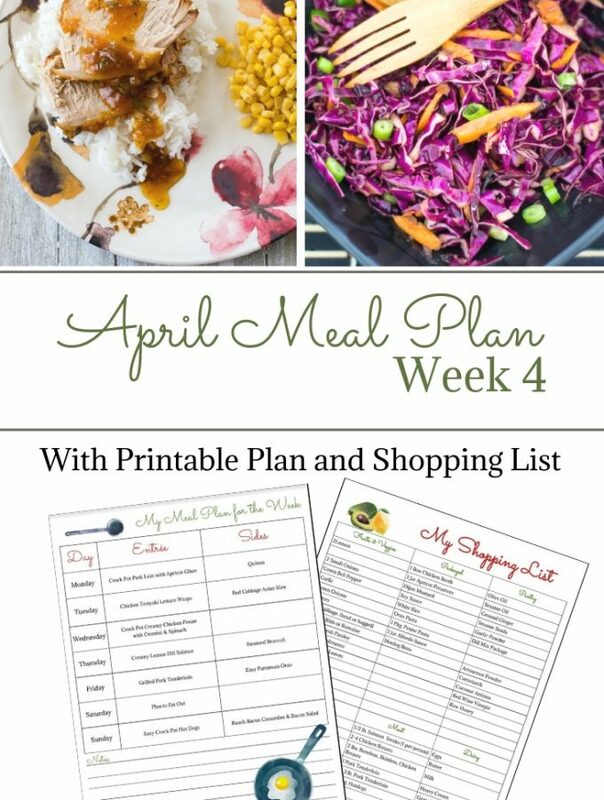 Sorry kinda new to this but trying to get away from processed things and would love to make this myself. The vanilla extract will last indefinitely. I store mine in the cabinet just like I would store bought vanilla extract. I have some that is over 2 years old dark and rich. It is so much better than store bought. Vanilla beans do need to be stored properly for them to last. They don’t go bad but do lose their moisture and get hard. If you buy them in bulk there is usually instructions on proper storage after opening the package. I will be posting soon what I do with vanilla beans that get dried out. Do you remove the beans at anytime or leave them in for all time? Amy I leave the beans in unless I am rebottling the vanilla into the small jars for gifts. 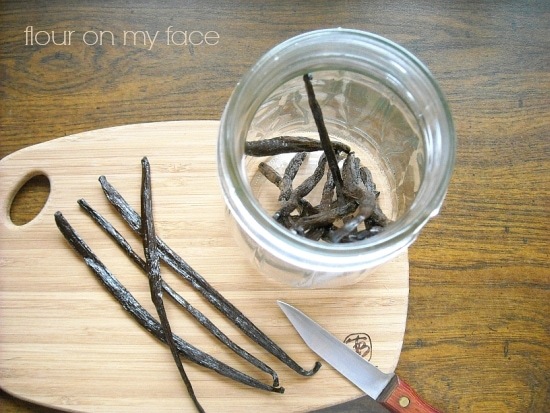 Then I add a fresh vanilla bean to the gift jars. Can you use another type of alcohol besides Vodka? The reason you use vodka is because vodka has very little flavor so the vanilla extract does not taste like the alcohol and picks up the rich flavor of vanilla beans. You could try a small bottle with whatever alcohol you’d like to see how overpowering the alcohol flavor is. I’ve never used anything but vodka.